Ile Maurice Nommee Depuis Ile De France. 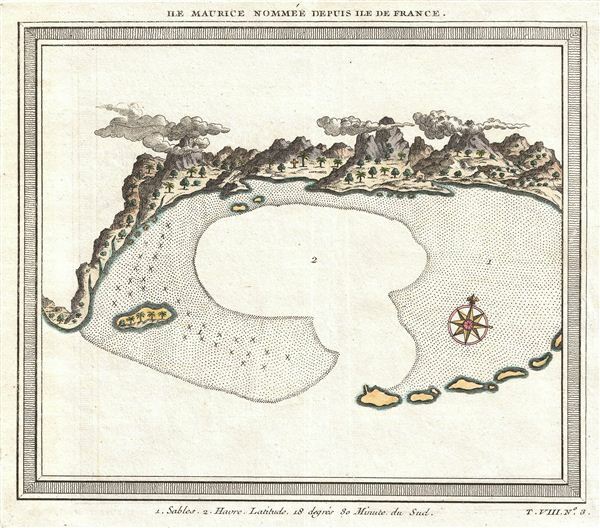 Bellin's interesting hand-colored, combined chart and view (replete with wispy clouds) of the harbor of the Ile Maurice, or Mauritius, from Prevost's influential Histoire Des Voyages, 1750. essentially a nautical view, this map details Mauritius following France's takeover of the island from the Dutch in 1715. The French renamed it Ile de France and, under French rule, it developed a prosperous economy based on sugar production. Mauritius was seized by the British Royal Navy during the Napoleonic Wars and became an independent country in 1968. Today most know Mauritius as a stunning island paradise with sparkling clear blue waters and sunny white beaches. Provost, A., L`Histoire Generale des Voyages, c. 1750, Vol. 8, plate 11. Very good. Original folds. Original platemark visible. Blank on verso.